ÆSIR is accredited and listed with the following Canadian Federal Government procurement paths. ÆSIR International Ltd. has had a long and successful relationship with many government agencies over the past eight years. 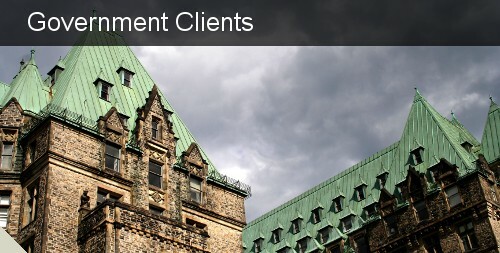 As an Ottawa based CADD consulting and training firm, it is only natural that we have had frequent dealings with Public Works and Government Services Canada (PWGSC) as well as the various Ministries and Departments, many of which are headquartered in Ottawa. In the past three years, the federal government and its ministries have accounted for not less than 48% of ÆSIR's annual gross revenues. Because of this, ÆSIR has worked hard to make dealing with us as easy as possible for all of our government clients. This has included listings through several procurement channels such as PBN, SRI, PS Online and DOS and security clearances with CISD. Each of these is explained in greater detail below. ÆSIR International Ltd. is listed with Industry Canada as a federal incorporation, and has established a Procurement Business Number which is valid in all provinces. This number uniquely identifies us in the SRI and all other government systems. The PBN will eventually become the common identifier for all government purchasing and payment systems as government moves further towards electronic commerce. The SRI provides for on-line registration allowing government buyers to search for sources of supply for low dollar value opportunities not included in MERX and it can be accessed by all departments and agencies. ÆSIR has listed itself under 48 GSINs (commodities) ranging from CADD services to Training and Presentation services. For a complete list of our commodities by GSIN, click here. The following is a complete list of ÆSIR's current GSIN listings. If you believe that a particular category should be added or deleted from this list, please do not hesitate to contact us. Both the GSIN listings and our current capabilities are always changing and evolving. Professional Services Online is an electronic procurement tool that assists federal departments in the procurement of professional services for contracts in amounts below the NAFTA threshold. Government departments can use this interactive website to search for suppliers of professional services. No MERX posting or lengthy RFP process is required to use PS Online listed companies. ÆSIR has recently been accepted into PS Online in many of both the IT and Non-IT categories. The five general PS Online categories for which ÆSIR has been listed are: IT Technical Writer, Technology Operator, Courseware Developer, Instructor, Training and Development Specialist. ÆSIR has successfully applied for and been granted Designated Organisation Screening (DOS) status with the Canadian Industrial Security Directorate (CISD) branch of Public Works and Government Services Canada (PWGSC). As a result, all ÆSIR employees now carry Enhanced Reliability clearances or better. Furthermore, ÆSIR may process additional clearances for any further required staff hired to complete a specific long-term project with any of our clients. ÆSIR has recently co-authored the NCA-Ops (National Capital Area-Operations) Block Symbol Library for PWGSC. We are very proud of our involvement in this project. To find out more, go to our Portfolio page, or link directly to the PWGSC CADD Standards web page.